In December 2013 the Abbott Government released an Energy Policy issues paper. "The Energy White Paper will set out a coherent and integrated approach to energy policy to reduce cost pressures on households and businesses, improve Australia's international competitiveness and grow our export base and economic prosperity." The Australian Government has committed to a set of signature economy-wide reforms to grow the economy while addressing rising business and household costs. The Australian Government is committed to working closely with industry and state and territory governments in the development of an integrated, coherent national energy policy. future growth in exports of energy products, including our world leading services industries. A Green Paper will be released for consultation in May 2014. The Energy White Paper will be completed in September 2014. The Energy White Paper will be led by the Department of Industry. An Issues Paper will be released by mid December 2013 to initiate consultation. With energy prices soaring and threatening jobs, manufacturing, mining and agriculture, the Government has delayed the release of the energy policy Green Paper. It was not completed in May. The White Paper - due to be completed in September 2014 - has also been delayed. The Energy Policy Green paper is now expected to be released in August. Further submissions will be sought on the release of this paper. It will be December before the Energy White Paper is released. @tautechnical and still electricity prices soar! But we know the shareholders,company directors and LNP are the only winners! Low cost, reliable energy has been a critical element of the international competitiveness of Australian industry and the living standards of households for several decades. The central role of low cost reliable coal in electricity generation has been the primary contributor to this competitive edge. But this advantage has been lost, with electricity prices now amongst the highest in the developed world, substantially due to ill-judged policy interventions. High energy costs represent a substantial burden on Australian households and industry, including the mining sector which accounted for 13.5 per cent of final energy consumption in 2011-12. Urgent repeal of the carbon tax, which should lead to an immediate 9 per cent decrease in energy costs. The phasing out of the Renewable Energy Target, which represents a $20 to $30 billion subsidy to the renewable sector by 2030, with the cost borne by industrial users and households. The Government should also recognise that costly efforts to change the energy mix ignore the substantial gains in low emissions technologies from traditional energy sources. 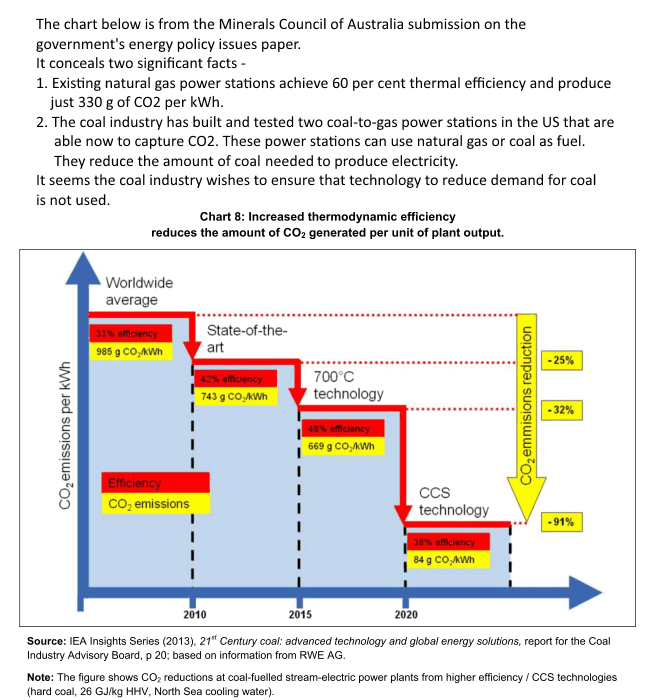 Australia does not have to choose between coal and a low emissions future. Comment: The "roadmap" to a low emissions coal future is increasingly clear. It is costly and relies on technology that is obsolete. See: "The Coal Lobby Scores an Own Goal"
"The market can solve problems I don't understand" - the last refuge of ignorance. Australians would still be using leaded petrol if their governments had the IPA's faith that "the market" can solve any problem and governments don't need and shouldn't maintain informed policy advice. It would be unfortunate if the White Paper were to be progressed as though, in the absence of government oversight, energy markets would not develop efficiently. Markets develop from the interactions of consumers with businesses, which seek to sell their goods, access inputs and reduce risks. Governments’ role is to allow these processes to be pursued and to uphold the law. Rather than a plethora of goals, the White Paper should have a single focus: to allow the market to bring about efficient production of energy with interventions limited to addressing natural monopoly situations. Anything beyond that will ensure the weaknesses presently evident will remain. Australia is likely to have the lowest cost sources of fossil fuel powered electricity generation in the world. These are, most significantly based on almost endless supplies of coal, much of which is conveniently located close to the main load centres. The coal used for local electricity generation has no real alternative uses as it is of too low a quality for profitable export (and in the case of brown coal is not even easily transportable). Australia’s low costs, on current technology, can generate unlimited amounts of base load power at around $35 per MWh. RESOURCE giants will be told to step up their spending on mammoth new projects or risk losing their rights to tap the deposits, under an Abbott government plan to accelerate investment and kill off fears of an end to the boom. The incoming government aims to use its power over the vast gas deposits to bring forward up to $180 billion in new investment, sending a blunt message to companies to develop rather than hoard the nation's resources. As Tony Abbott and his ministers prepare to be sworn into office today, the resource plan marks another stage in an economic agenda that promises to lift growth, but will depend on stronger business investment to deliver results. The policy is also set to reignite debate on the cost burdens - including high salaries - that global companies blame for stalling Australian projects and diverting their investments into cheaper projects in Africa and Asia. Incoming industry minister Ian Macfarlane told The Australian that companies should extract "every molecule" of gas to boost exports and supply the domestic market. Mr Macfarlane warned that companies that shelved their projects could lose the "retention leases" they held over the reserves, given the commonwealth's power to revoke the rights as they came up for renewal over the next few years. "I want to put the industry on notice that if the deposits are able to be developed they've got to be developed," he said yesterday as he arrived in Canberra for briefings. "We've got to make sure that every molecule of gas that can come out of the ground does so. Provided we've got the environmental approvals right, we should develop everything we can." The policy is expected to be put into place in coming days as Mr Macfarlane meets officials to review a list of retention leases that expire during this term of parliament, triggering talks with companies over their plans. The priority is expected to be Woodside Petroleum's enormous Browse project, which is on hold as the company seeks approval from federal and West Australian governments to build an offshore "floating" LNG facility rather than build a hub at James Price Point north of Broome. Woodside's requirements include a variation in the retention leases over the Browse reservoir. West Australian Premier Colin Barnett objects to the offshore plan on the grounds that more jobs will be created if the gas is pumped through pipes to James Price Point, but Mr Macfarlane supports the floating LNG plan and is preparing for talks to reach a compromise. "I'd expect Colin to speak up for Western Australia, but I'd expect there to be some middle ground," said Mr Macfarlane, who returns to a portfolio he held during the Howard government. In his first interview since the election on the outlook for the resources sector, Mr Macfarlane rubbished Kevin Rudd's claims during the election campaign that the "China boom" was ending. Mr Macfarlane argued instead that Labor had slowed the sector by imposing the carbon tax, the mining tax and a tax on oil condensate, as well as launching personal fights with industry leaders such as Gina Rinehart and Andrew Forrest. "That whole chapter's been slammed shut," Mr Macfarlane said. "We're opening a new chapter about working with the industry, creating jobs and making Australia an energy superpower." Companies across the sector are prepared for the talks over project timeframes and their retention leases, given pressure from former Labor resources minister Martin Ferguson to develop their deposits. "I want to do this in a structured way so we don't affect our investment profile," Mr Macfarlane said. "We don't want to scare the horses. I've got no targets, no hit list, but no sacred cows and everything is on the table." The plan to spur investment depends, however, on overcoming cost barriers that companies blame for delaying their plans. About $200bn is being spent on seven LNG facilities across the country, according to the Australian Petroleum Production and Exploration Association. Another $180bn would be invested if companies signed off on a further list of projects, according to a study for APPEA by consulting firm McKinsey, although this includes coal-seam gas projects as well as the offshore deposits covered by retention leases. Chevron Australia managing director Roy Krzywosinski, Origin Energy chief executive Grant King and former Shell Australia country manager Ann Pickard told The Australian in May that "significant national leadership" was needed to speed up projects by lifting productivity and improving industrial relations. While unions dispute the cost claims, company executives insist that most of their workers in Australia earn more than equivalent workers in the US and that it can be more cost-effective to develop LNG in other countries. APPEA external affairs director Michael Bradley said urgent steps had to be taken to fix the nation's "sliding international competitiveness". "It is critical that steps are taken to ensure Australia secures its share of the next wave of global oil and gas projects," Mr Bradley said yesterday. Mr Macfarlane said the Coalition was acting to cut industry costs by removing taxes that Labor imposed on the industry. He also intends to work with incoming environment minister Greg Hunt to streamline the green tape that companies must comply with to get environmental approval for their projects. The Internet of Things (IoT) takes advantage of Cloud Connected Embedded Systems, and these systems can be found in products all around you. Products such as wearable fitness monitors, home security systems and automation systems, garage door openers, industrial controls and more. Microchip Masters Conference can get you ready to connect your product to the cloud…fast. Click here to find a list of IoT classes at Microchip Masters. Feb. 23, 2014 - China demolishes steel furnaces in northern Hebei Province as part of efforts to curb pollution, state media reports. China on Sunday (February 23) demolished 19 steel furnaces in its top steel-producing province of Hebei to reduce production overcapacity as part of an effort to ease air pollution, state media reported. Nineteen furnaces were torn down on Sunday morning in five cities of Hebei, a major industrial region which surrounds Beijing, as parts of China's campaign against industrial pollution, China's state broadcaster CCTV reported. "China has vowed to tackle pollution and slash coal use." China has vowed to tackle pollution in Hebei, saying in a wide-ranging action plan in September that it would ban new projects in some industries, close outdated steel and cement facilities, and slash coal use. Hebei, home to some of the most polluted cities in China, has promised to cut total steel capacity by 86 million tonnes, about 40 percent of last year's production, by 2020. Its capital Shijiazhuang routinely recorded "beyond index" measurements of particulate matter (PM) in early 2013. The demolition on Sunday was expected to reduce steel and iron production by 8.02 million tonnes, CCTV said. Get new music videos and MTV show videos on MTV.COM.AU. One-third of Australia’s coal mining operations are operating at a loss, saying it was cheaper than copping take-or-pay bills. One-third of Australia’s coal mining operations are operating at a loss, according to internal estimates from mining major Glencore. Reports have circulated in the industry that many operations have been running at a loss for some time in the hope the coal price would bounce back, with a number of miners in the past saying it was cheaper to mine through the loss than cop take-or-pay bills. This chart, obtained by Business Insider from Glencore, combines internal data with other industry information and shows about one third of Australia’s coal mines are operating at a loss. 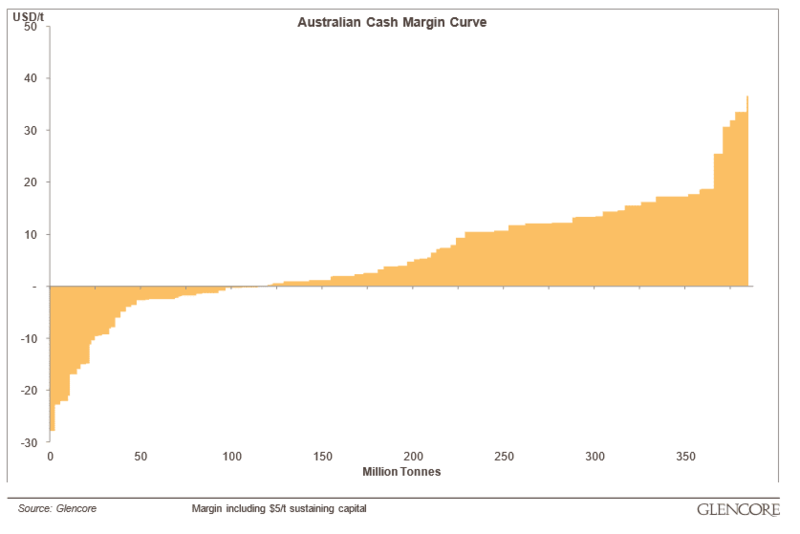 Each vertical line represents a mine and shows the size of its marginal loss. Across the bottom are cumulative tonnes produced in Australia. The chart shows a good portion of operations are teetering just above or below the line and are the ones most sensitive to movements in the Aussie dollar or coal price. The smaller portion which are making good returns, on the right hand side, Glencore said are mostly newer, open-cut operations which are easier to mine. In 1974 Arthur C. Clarke predicted that Australians in 2001 would have access to the internet from their homes. His prediction envisioned central mainframe computers accessed from terminals. This was a reasonable assumption as companies such Intel, Microsoft and Apple - the creators of low-cost personal computers - could not have been imagined. The fossil fuel industry fobs off competition from renewable energy with comparisons to "grid-parity" pricing: claiming that the cost of solar energy is greater than the cost of energy produced at a coal-fired power station. The problem the fossil fuel industry faces in Australia is a decade of unfortunate government policy choices that has resulted in one of the most expensive electricity distribution grids in the world and soaring natural gas prices. So-called "cheap" fossil energy that costs a few cents per kilowatt-hour to produce in central power stations has a retail price of between 20 cents and 50 cents for Australian households and business. Against this background Australian researchers are at the forefront of solar photovoltaic technology and have invented two of the four leading energy storage technologies in the world. Four of the world's 6 largest solar panel manufacturers maintain close research links with their technology developers at the University of NSW. The University of NSW is also the inventor of the vanadium redox flow battery that Prudent Energy is developing and marketing. The CSIRO is the inventor of the UltraBattery being developed and marketed by Ecoult. In just 6 years - from 2008 to 2014 - the price of a solar power systems suitable for producing electricity where it is consumed has fallen to almost one-sixth of its 2008 value. A 1 kilowatt system could be installed for $8,000 in 2008. In 2014 a 6 kilowatt system can be installed for $8,500. The notion of "grid-parity" the fossil fuel industry talks about is irrelevant when you don't need an electricity grid to move electricity produced on your roof to a battery and into your home or business. Personal power stations and the high retail cost of energy in Australia have made central fossil fuel power stations obsolete.